I think I need a USB-powered vacuum for my notebook keyboard, what with my late nights in front of the computer and all, along with a steady diet of pizza and other pastries which tend to leave plenty of crumbs in between my keys. Henry the Hoover looks like a pretty nice guy to help me out in my crumbed predicament. 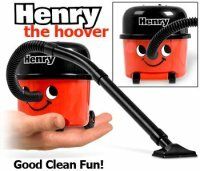 Now in a mini desktop size, this Henry the Hoover is your desktop crumb buster. Pop in the batteries, press on and get vacuuming up the remnance of your tea break. Empty your crumbs by unscrewing Henry’s hat and tipping the contents into the bin. Silly yet practical, this cheeky chappy deserves a space on any self respecting biscuit fan’s worktop. Powered by a couple of AA batteries, Henry the Hoover will retail for £9.99.